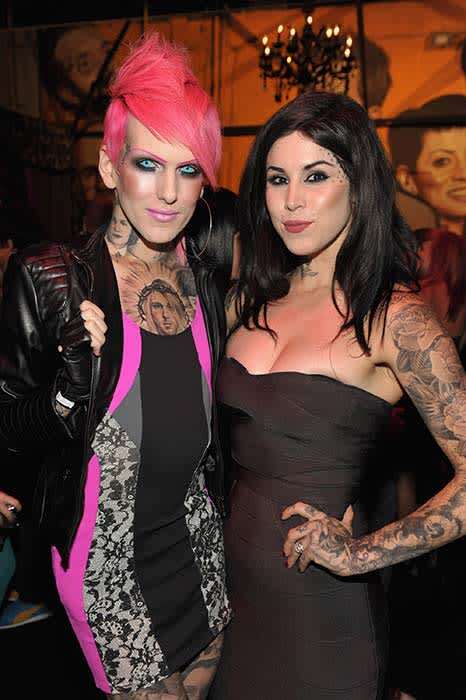 Beauty stars Kat Von D and Jeffree Star fall out via social media | HELLO! Hot on the heels of Taylor Swift and Kim Kardashian's online feud there has been another public spat between two famous faces – beauty stars Kat Von D and Jeffree Star. The pair had been friends since 2006, but Kat publicly ended their relationship on Tuesday, posting an Instagram photo of Jeffree with a red 'no' symbol over his face. The 34-year-old said she was "disassociating" herself from her former friend, who she accused of refusing to pay an artist for a logo. "After years of making excuses for, and rationalizing Jeffree's inappropriate behaviour (including promoting drug use, racism and bullying) I can no longer hold my tongue after recent events," Kat wrote. "I know that over the years, many of you were introduced to Jeffree through me, and regardless if you chose to continue to follow him or not, I just would like to disassociate myself from him and his brand from this point on." Kat continued to apologise for anyone who has "ever had to deal with any of his negativity", and revealed that she would be discontinuing the lipstick shade named after Jeffree in her make-up collection. Jeffree responded with a series of tweets accusing Kat of making up the allegations and for not supporting him when he launched his own brand. "Someone I haven't seen in over a year, wants to make a post about me. I'm yawning right now…" he wrote. "Kat and I texted a few days ago after 6 MONTHS of silence. She never supported me or my brand and got distant when I launched mine." Later in the day he said that he had paid the artist for designing his branding – something Kat still refused to believe. "Jeffree. Please, do yourself a favour and stop lying. BJ texted me that you reached out w a settlement proposal an hour after I posted video," she tweeted. "So things are not 'settled' just yet. Would it be so hard to, for once, sincerely just apologise, make things right and move on?"